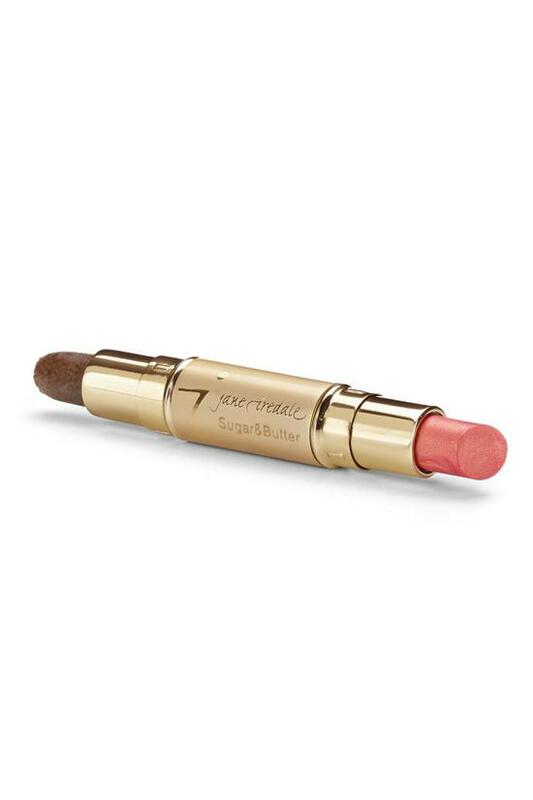 Soft, beautiful and oh-so-kissable lips are yours with Jane Iredale's lip exfoliator/plumper duo. Organic Brown Sugar gently removes dull, dry skin. With no chemical preservatives or synthetic dyes to worry about, eat the sugar crystals right off your lips! Then, apply the tinted lip plumper with Shea Butter and peptides that moisten and plump. Peptides have been shown to increase hydration and stimulate Collagen synthesis. A simple sweep will give your lips a natural, glowing pink tint while plumping and diminishing lines to reduce feathering. You can actually feel this plumper working when the cool Mint and Ginger ingredients start doing their job! Available in: Sheer Peach/Pink (Matte). 0.1 oz. To condition dry, chapped lips, sweep the organic brown sugar exfoliator across lips to gently lift away dead cells. Then, apply the lip plumper. For "plumping only" and sheer color in a choice of shades, use Just Kissed Lip Plumper. Lip Exfoliator Ingredients: Turbinado Sugar, Macadamia Integrifolia Seed Oil, Sunflower Seed Oil, Avocado Oil, Carnauba Wax, Candelilla Wax, Jojoba Seed Oil, Aloe Barbadensis Leaf Extract, Tocopherol, Ascorbyl Palmitate. Lip Plumper: Ingredients: Triisostearyl Citrate, Avocado Oil, Carnauba Wax, Beeswax, Jojoba Seed Oil, Candelilla Wax, Sunflower Seed Oil, Shea Butter, Flavor, Green Tea Leaf Extract, Grape Seed Extract, Ethylhexyl Palmitate, Tribehenin, Sorbitan Isostearate, Palmitoyl Oligopeptide, Cranberry Fruit Extract, Tocopherol, Ascorbyl Palmitate. May Contain: Mica, Iron Oxides.